Recently after the System Refresh activity we have came across the situation where most of the background jobs are failing as step user is not exists in quality/pre prod, multiple users defined hundreds of jobs in the system where some of the jobs requires to be continue on the system & some can be delete. Manually changing the step user ID of these hundreds of jobs is time taken process & there will be a chance of mistake, for this type of situation there is a good report “SA38 – BTC_MASS_JOB_CHANGE” which can perform this task in a very simple way. 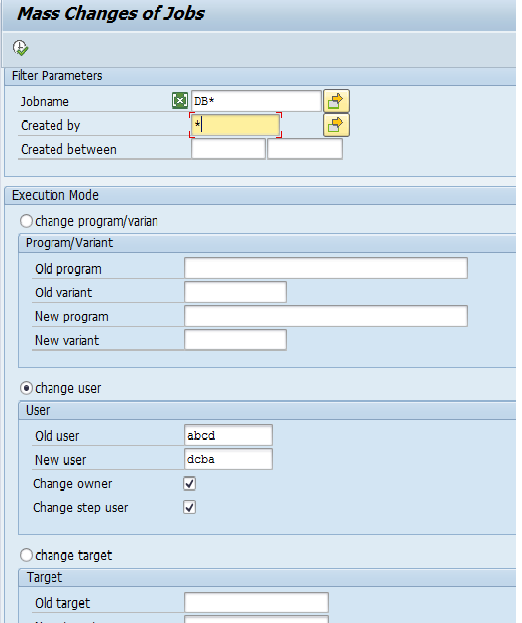 This report can perform the Single/Mass job change on the system including owner/step user.